Surf News Network, 6 January, 2015. Carlsbad – Surftech announced today its new lineup of shapers and brands for its 2015 Surf Collection that will be premiering this week at Surf Expo, January 8-10 in Orlando, FL. The new lineup will feature boards designed by some of the world’s best craftsman and shapers, along with Surftech’s new in-house lineup of boards. In addition to the new boards, a number of new technologies are being introduced, furthering their premium product line for surfers, paddlers and waterman around the world. The shift in focus is a reflection of the new leadership in the company and the new additions to the management team that took place in 2014. The company has made a conscious decision to aggressively pair down the overall number of brands they were going to work with, choosing to introduce their new technologies with only select shapers and brands. The decision frees up resources to focus on the expansion of new models with our current shapers as well as creating new partnerships with new and relevant brands in the marketplace. The 2015 Surf lineup will see the introduction of the new Hyper-Drive Epoxy (HDE) construction to compliment an expansion of the extremely popular and proven TL Pro Carbon (TLPC) construction. The new TLPC construction is the flag ship product in Surftech’s 2015 surf line, using proprietary fused cell foam and combining strategically placed carbon fiber patches and epoxy resin to create a board that has dynamic flex, memory, is light weight and extremely durable. The 2015 Surf lineup includes new board models from Channel Islands, Rusty Surfboards, Robert August and Mickey Munoz, who will be re-releasing his famed Ultraglide line as well as reintroducing legendary shaper and designer Bob McTavish, who will unveil three new Surftech models at Surf Expo. In addition there will be several new shapers and brands added to the Surftech family that will be introduced throughout 2015. 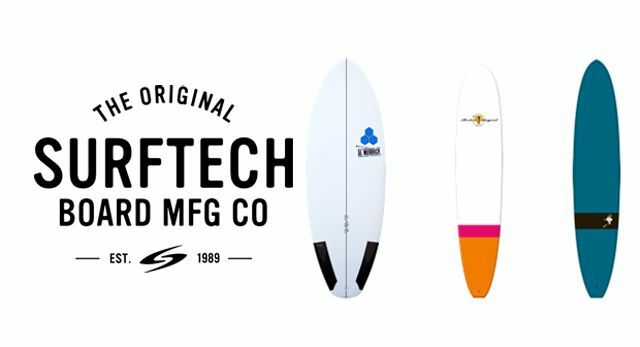 Surftech will be introducing its new in-house lineup of surfboards, internally referred to as the “EMQ”, or Every Man’s Quiver, in two new proprietary construction techniques, HDE and PowerFlex. The new boards, designed by Surftech’s in-house shaping team and tested by surfers around the world, offer a high performance alternative price point solution for surf shops and surfers everywhere. Surftech will be at booth 651 at Surf Expo, January 8-10 in Orlando, FL. In addition to the new Surf Collection, Surftech will have a complete lineup BARK Stand Up Paddleboards and Prone Paddleboards, including the world record breaking 12′ Commander that set the world record at Molokai-2-Oahu World Championships of Paddleboarding in 2014. Joe Bark will be on hand at the Surftech booth to talk about design and what’s ahead for 2015.